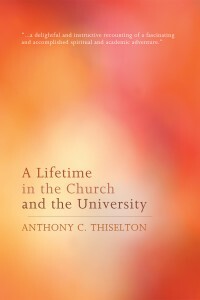 I’ve today read Professor Anthony Thiselton’s enjoyable, brief (114 pages), and readable chronicle of his life and work, A Lifetime in the Church and the University (Eugene, OR: Wipe & Stock, 2015; ISBN 978 1 40197 540 7; $15.00). It’s a good read, lively, and sheds interesting light on Thiselton’s life and times. I’m grateful to the publishers for kindly providing a review copy. 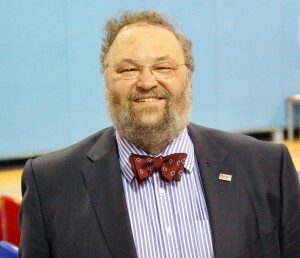 One of the extraordinary points is that Prof. Thiselton was almost turned down for training for ordination in the Church of England because of his poor eyesight—the medical examiner who met him thought he would never be able to read enough to sustain ordained ministry. Happily, the then-Bishop of Southwark, Bertram Simpson, had the sense to overrule this advice (p 4)! Indeed, Prof. Thiselton highlights at a number of points the providence of God in preserving him: he experienced much illness as a child (chapter 1), and then suffered a potentially-fatal stroke in 2007 (pp 99-101), since which he has written eight books! 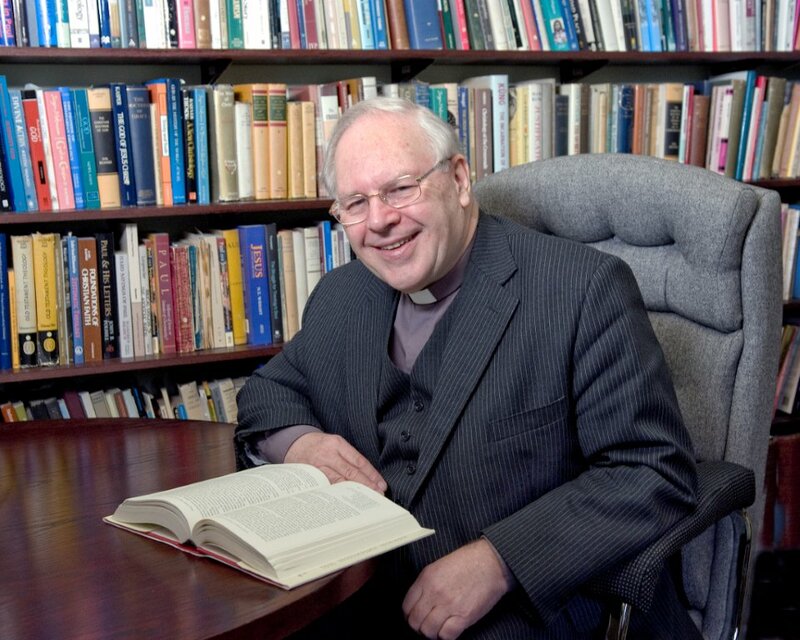 Prof. Thiselton has packed a massive amount into his life: he preaches regularly (still today in his late 70s), he has served in five universities, three theological colleges, and on numerous church committees and boards. He was one of the longest-serving members of the Church of England’s Doctrine Commission, and records his contributions to a number of key reports (chapter 5), as well as a summary of a legendary, hilarious speech to General Synod about one key report (pp 83-84) which included an account of meeting three young men on a train to York who were drinking ‘logarithmic’ quantities of lager and quizzing him for two hours on The Mystery of Salvation. There is interesting discussion of his major writing projects, although I’d have loved to learn more about how his interest in hermeneutics—the subject for which he is known above others—originated. Somewhat surprisingly, he does not mention his pioneering PhD work, later published as The Two Horizons—this book, along with his writing and talk (chaired, I recall, by John Goldingay) on hermeneutics at the 1977 National Evangelical Anglican Congress in Nottingham, launched him into popular Anglican recognition. He characteristically tells the story against himself of looking around for an overhead projector slide on this occasion, and having others tell him that he was holding it in his hand (p 42)—I remember the occasion well! This is not, in other words, an ‘intellectual biography’, which reflects on influences, development and the like—Prof. Thiselton points to the work of Dr Robert Knowles for those interested in this (pp 106-7). Rather, this is the story of a man who places serving Christ in the church and the academy at the centre of his concerns, and focuses on deeds and actions, rather than ideas. That said, a number of his concerns come through in places: hesitations about some features of the charismatic movement; concern for serious thought about healing which includes those who are not healed; engagement with the thinking of the contemporary world, not least postmodernity; the need for Christian liturgy to reflect good scholarship, including a debate on the Greek word ἐκ in the creed; and much else. His account of his early life and call to ordination (chapter 1) is gracious and thoughtful. Prof. Thiselton is not a man to speak ill of others unnecessarily, and he passes quickly over the break-up of his parents’ marriage (p 4), as he later writes only briefly of what was clearly a less-than-happy experience of two years as Principal of St John’s College, Nottingham (pp 57-60). It is clear that he has learned from difficult experiences and has a strong sense of God’s providential care in the way his life has developed and in the doors which have opened to him. He concludes: ‘It remains appropriate to end on the note of heartfelt thanksgiving to God and to all who have made it possible to live out this calling’ (p 114). 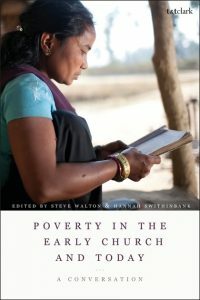 This is an enjoyable read, well worth engaging with, not least for people like myself who find themselves serving both academy and church. Warmly recommended! An exciting conference on the Greek verb!